Rachael Smith's Artificial Flowers represents another leap forward for the cartoonist. Her specialty is zeroing in on and mocking the angst of twentysomething artist types, like in her previous book, House Party. While her characters are certainly quirky and overwrought in fun ways, Smith's starting to write them as more than just a collection of quirks. 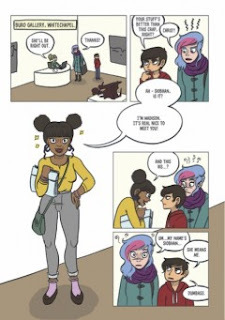 The book is about an artist named Siobhan, who's trying to establish herself in the London art world while sponging off of her parents for an allowance. Smith quickly establishes her world as she spends much of her allowance at the nearby bar and is struggling to get her paintings any attention. Her parents then drop off her teenage brother because they want to go on a cruise and can't deal with his pyromania and general antisocial tendencies. The narrative gets its big push when Chris gets angry at Siobhan and burns part of her paintings. She's initially furious, until Madison, the head of a gallery, (that Siobhan happens to have a crush on) deems the charred paintings brilliant and gives Siobhan her own show. The structure of the book is roughly two acts and an epilogue. The first act is all character-building, as we are meant to find Siobhan to be a sympathetic character--up to a point. Sure, she has to deal with art-world nonsense (and to be sure, making fun of the art world is like shooting fish in a barrel), but she's lazy and selfish. One never gets the sense of just how unstable Chris really is, or if his bad behavior has more to do with his parents. The first act ends when Chris burns the paintings, and the second act details Siobhan's dizzying rise in the art world, as Chris becomes her secret collaborator. Siobhan starts spending all of her earnings on her new girlfriend Madison and putting on airs, until it all collapses when her parents find out about Siobhan encouraging Chris to play with fire and put an end to everything. Smith's pacing and gags ramp up in this section, and the art keeps up accordingly, with splash pages and bugged-out eyes. Bryan Lee O'Malley remains an obvious influence on her work, but Smith's line has started to take a more rubbery quality befitting the frantic nature of her sense of humor. The happy endings that are doled out are all satisfying and well-earned, as her characters grow in interesting and sometimes unexpected ways. While Smith's line has become more lively to be sure, her calling card continues to be her use of color. She's toned it down a bit in saturating every page in dense colors, but her characters pop on the page thanks to their color scheme. Smith has simply muted her overall palette, especially in terms of backgrounds. That allows the linework to be more effective on the page, but Smith can always turn up the bright reds whenever she wants to back up extremes of emotion or action in the story. Smith's greatest skill as a writer is making a mess of her characters' lives and then figuring out the pieces of the puzzle that will put them back together.